We are in the final throes of what has already been a hectic summer transfer window, and it now looks likely that at least one more huge name will be on the move, with Falcao possibly strengthening an already way-too-good Man City attack. According to Gianluca Di Marzio's site (Di Marzio is sort of like soccer's Adrian Wojnarowski, so what he says is gospel), the sky blues now join a growing number of clubs hoping to pry away Colombian superstar Falcao from his Monaco home. The report names Arsenal as one of his other suitors, but the striker has also been linked to Juventus, Real Madrid, and basically every other team with mountains of cash and a taste for expensive forwards. Arsenal's interest made sense even before the recent Olivier Giroud injury, Juventus are apparently out to collect all the strikers, and Real Madrid do need some alternative to Karim Benzema, who's currently the only real center forward on the roster. Why not upgrade your team with the prolific poacher who, just a year ago before his ACL injury, was considered by everyone to be the best pure striker doing it? The loss of Giroud skyrockets the possibility of Wenger soon moving to sign another pure striker. Man City, though, are coming off a season where their top three strikers all enjoyed stretches of dominance, and Stevan Jovetić early on looks to have put his injury-riddled debut campaign behind him to show how good he can be, too. Even if Álvaro Negredo eventually leaves to make way, it's not exactly clear why spending £20 million on a year-long loan, as Monaco reportedly are asking for, is necessary. 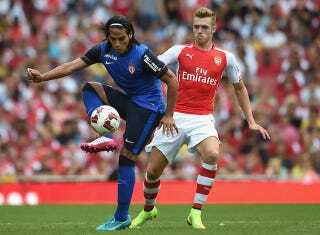 Arsenal could yet sign Falcao if this meeting goes according to plan. Of course, necessary is never really the question for these clubs. The biggest, riches teams in the world—the smart ones, at least—strengthen their strengths, overhaul positions of weaknesses, and generally collect talent first and ask questions later. Monaco thought they had joined those ranks when they bought Falcao, James Rodríguez (who also made his way to the way-too-good Real Madrid a few weeks ago), and João Moutinho a couple season ago, but it now seems like they're one of the many Little Man Cities That Couldn't. It would be fitting, then, if the death knell of AS Monaco: Super Club is struck by the very team they sought to imitate.